This perennial favorite from pastoral experts Sr. Donna Ciangio, O.P., and Fr. Thomas B. Iwanowski returns for Lent 2012 (Cycle B). 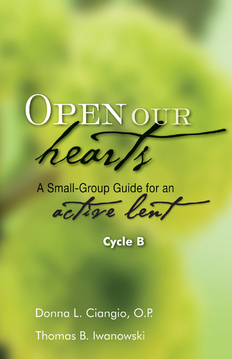 Open Our Hearts is a Lectionary-based, small-group booklet that contains everything needed for a successful parish-based Lenten program, including meatless soup recipes for groups that want to begin faith-sharing with a simple meal. It provides a basic introduction, guidelines for six weekly, small-group faith-sharing sessions, and daily scripture meditations to keep participants engaged throughout each week. Sunday gospel texts are printed right in the booklet, and citations with brief commentaries on the first and second readings appear as sidebars. Group sessions link the scriptures with informative and practical commentary and reflection questions, space for written responses, prayers, and suggested activities help reinforce the week’s message.